Jamie Geer isn’t some one-dimensional competition barbecue cook. After a career in welding, he started building smokers. They were some of the prettiest ones out there, but also made other cooks a lot more competitive. These days you don’t have to look very hard to find a Jambo pit at your local barbecue cook-off. If there are people there who take winning seriously, chances are you’ll see a few of Jamie’s chrome exhaust stacks rising above the crowd. You’ll also find Jamie Geer out on the competition circuit a lot more this year. In 2013 he opened a restaurant Jambo’s BBQ Shack in Rendon, near his house just south of Fort Worth. The early reviews were good ones, but he quickly had enough of the barbecue business. Now that he’s found a willing buyer, he’s ready to get back out on the competition trail. Geer is planning to hit thirty competitions across the country, but a stop in Houston at the Houston Livestock Show and Rodeo will be an early test in February. He’ll be there to defend his crown as last year’s winner, and you can bet he’ll be a up against a few cooks using one of his pits. Daniel Vaughn: What have been your biggest competition barbecue wins? Jamie Geer: This year I had a real good year. I won Houston [Livestock Show and Rodeo], qualified for the Royal and won ribs in the Invitational side, then got sixth in the Open. I finished nineteenth overall out of 561 cooks. Then PBR had a big one up here in Decatur, Texas. There were 115 there and I won Grand Champion. I also qualified for The Jack and finished fifth overall, then I went to King of the Smokers and I finished eleventh out of the top 24 teams. DV: That one is like an all-star competition, right? DV: Is it still fun for you? JG: Oh yeah. These guys I got here to help me build these pits, they don’t even need me around. When I had the restaurant [Jambo’s BBQ Shack] up there, they had my back. I’m going to go hit up a bunch of competitions in Oklahoma. DV: What year did you first enter a competition? DV: And how old is the pit business? JG: I built my first pit in 1989, but Jambo Pits officially started eight years ago. DV: Was that first pit for yourself for competitions? JG: It was. It’s still sitting at a buddy of mine’s house. I’m out of room here, so I can’t store it. There were two that I built, and one of my worst enemies has the other one. DV: Why is he your worst enemy? JG: He has come out with a new pit that looks just like mine. I confronted him at the American Royal. I had it all the way up to here with him. He has a video where he opened the door to the pit, the closed it to keep from showing how the airflow works. Like I told my wife, I feel privileged to have a product good enough that everyone wants to copy it. DV: How much does it cost to buy a Jambo? JG: This pit here, the J-3 model, is our biggest pit, and I get $8600 for it. He’s got his priced at $22,000. [It’s actually priced at $10,900 on Davis’s website]. But this was the year for Jambos. They won every major cookoff. DV: That second Jambo pit, did you build it for Mike Davis? JG: No. It was for Johnny Trigg. He and Mike Davis were hooked at the hip. I built Johnny another one, a J-5. Johnny sold Mike the first one. Johnny showed him how to cook, then Mike started winning. DV: Was it the pit? JG: Anybody can cook on anything, but you’ve got to have something to work with. Tuffy [Stone] just calls it a tool. DV: Are Johnny and Mike Davis still buddies? DV: I thought barbecue competitions were all about brotherhood. JG: Oh, there’s a lot of cut throat out there. Don’t get me wrong. There are a bunch of guys who go to cook-offs just to beat somebody. DV: Who is it that you want to beat? JG: Everybody. I go to win. It doesn’t always work out for you. When I started out it was all about the meat. It was how good your meat was. Today’s barbecue is all about the sauce. I hate that. Now there are so many competition sauces out there that it’s unreal. I’m old school. Some competitions I don’t even put sauce on it. DV: What sauce did you use on your winning chicken in Houston? JG: I used Craig’s sauce which is a take on Head Country sauce. Most of the competition cooks out there use Head Country sauce. That’s one of the tings I don’t like about KCBS judges. Say you go out and judge every week and you like the taste of Blues Hog sauce. Now you might score me down because I didn’t put the right sauce on there. IBCA gets Joe blow off the street to judge your meat. They haven’t even heard of these sauces. In the end, I just don’t like sauce. DV: You would prefer to compete in the IBCA? DV: It seems like a lot of Texas competition cooks are getting in KCBS contests. Is that a recent development? JG: Yes, but KCBS is starting to get down into Texas. There will be five competitions here this year. DV: If you go back ten years, were the cooks in Texas just doing Texas competitions? JG: Yes. I like KCBS because it’s a little easier. In a normal KCBS contest there might be twenty-five entries with just two or three heavy hitters. When you go to a cook-off in Texas, there are forty to sixty cooks and ten of them can kick your a–. DV: Back when you built that first pit, what made you want to build it, and why did you think you could build a good one? JG: I tried to go to college at Abilene Christian, but they were going to make me go to Biblical Science an hour a day so I quit and came home. Now I had to go to work, so I went to work with my uncle in a welding shop. I’ve been cooking outside all my life out camping or hunting. My uncle had a big party and we cooked deer meat. I found this Adkins seasoning – Western Style Barbecue Seasoning – so I bought some. I tried some on the deer meat, and my uncle flipped out. He loved it, so we put it on all the deer meat, like twenty hindquarters. People raved over it, and that’s kinda how I got into cooking. DV: What would you have seasoned it with otherwise? JG: Salt, pepper, and garlic like every other household in America. DV: But you wowed them with Adkins? JG: I did, and I still use it today. Anyway, I went over to work at Stafford Metal Products. We had a Christmas party. I asked them if I could cook with a makeshift pit I’d made with my uncle. Everybody liked it. Richard and Ray Batterton worked there and they loved it. They said “boy, have you ever thought about entering a competition?” That sounded like fun. DV: There weren’t a whole lot of competitions around then, were there? JG: That was when the North Texas BBQ Association and IBCA were just getting started. I went over to see their pits and there was a real wow factor. They had stainless around the bottom and a stainless stack. I went back and built my first one out of the dumpster at Stafford Metal Products. My grandfather had died and they dug out his old propane tank and put it in the creek behind his house. I went over and pulled it out of there with my truck and cleaned it up. It was rusted like crazy. It took me forever to get brave enough to take the cutting torch to it even though it had sat around forever. DV: You were afraid it might still have some propane left? JG: I got online and they said to fill it full of water. I cut into it and nothing happened. It was 30” and six feet long. I put it together, and it looks just like a J-5 now. DV: So you didn’t start out small. JG: Nope. I went big right from the start, but I built it on a very low budget. DV: You make some shiny looking pits. Should barbecue pits be this pretty? JG: Well, I’ve always loved street cars and hot rods. I wanted to build like that. DV: How did you get the airflow right? JG: I probably went through 300 cans of biscuits. I’d lay them down all the way across about eight inches apart. We’d grab a beer and fire it up. After about thirty minutes we’d open it up and look at the color and check the temps. I’d move the damper about 1/8” with every batch. It took about two weeks, then one day every biscuit was within five degrees of each other so I tack welded it and tested it the next day. It was just the same, so I welded that SOB up right there. That angle is still what we use in all the pits I build. DV: No need for an adjustable damper then? JG: It’s all about air flow, just like the rotisserie pits. They wouldn’t cook for s— if the meat wasn’t going around and moving the air. JG: I couldn’t afford to buy meat for that. Biscuits were white, so I could see the color on them. DV: You’ve got this successful business, but then you go into the competition circuit and everyone is using your secret weapon because you sold it to them. Does that put you at a disadvantage? JG: No. It comes down to your meat. DV: How many of these do you sell? JG: We put out about thirty a year. I have twenty-six on order now. DV: How long does it take to make them? JG: We started this one here on Monday morning [four days earlier, and it’s completed]. Every one of us know every dimension because we build the same thing day in and day out. We don’t have any drawings. 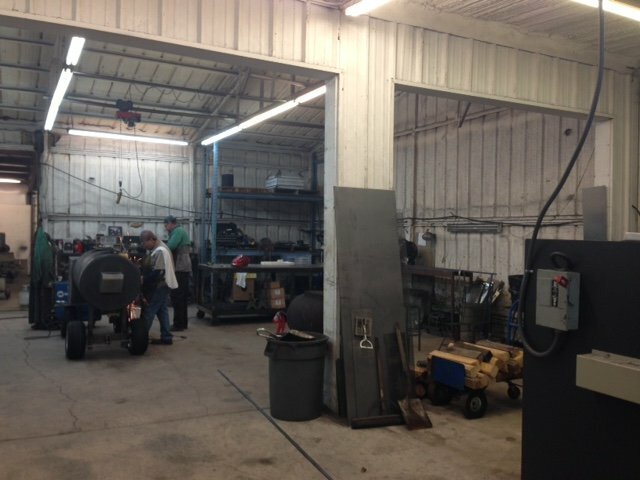 DV: You said that first smoker was built from a propane tank, but here you roll your own steel and weld it. Is there a reason that’s better than using an old propane tank? JG: We use a P&O material. Pipe has a real nasty mill scale on it, but this stuff is smooth. It’s easy to weld and grind. DV: And it takes those fancy paint jobs well. JG: Oh yeah. It’s not all rough. DV: There are three people in the shop now. How long did you do it by yourself? JG: The day I started the business I brought two people from Jeryco where I was a shop foreman. DV: When that job went away, did you immediately decide to start building barbecue pits? DV: How many other pits had you built at that point? JG: Maybe five for fun money. DV: How did you come up with the name Jambo? JG: It was for Jamie and Bobby, my friend Bobby Sanders. I tell everybody “I was going to my shop and I saw that La Bare had a sign out for a 200 and over class. The prize was $500 so I went down there to dance.” I tell them “I put on a pair of combat boots and a camouflaged G-string. I tied a bandanna around my head and called myself Jambo instead of Rambo.” They always want to know if I won. DV: Honestly, how many times have you considered dressing up as Jambo for Halloween? DV: After you opened, how did you find people who needed a pit? JG: I got a buddy of mine to build a website for Jambo. I put it up. I got some phone calls within a few hours and sold ten pits in the first week. I had to order everything. I immediately bought a stomp shear to cut metal. We worked ten hours a day and I didn’t have any time to cook then. DV: How did you get into the restaurant business? JG: I’d look at Craigslist every morning to see if there was any barbecue equipment. There was a listing for a complete restaurant. It said “must sell today. $10,000.” I went up there and offered to build him a pit, but he needed cash. I offered $4500 cash and he took it. I loaded it up and on my way back home I saw a “For Rent” sign on a restaurant just up the road. I still had the equipment on the trailer. This is the gospel truth. I said I was looking for a building, and he said “$1000 per month for a five year lease.” I said “done deal.” I took me a month and half to clean it up. DV: Six weeks to get a restaurant open still isn’t bad. JG: We opened up in June 2013 and got overwhelmed. I was thinking we might sell four briskets a day, but it took off. DV: Were you spending all your time there? JG: Yes. I got there at 5:00 in the morning every day because I cooked everything fresh. Then I got into making my own sausage. I had to do that on my day off. My wife had been retired, but I drug her up there to work every day. She said “we’ve got to sell this place.” I lived out my dream and it was very profitable for me. People would just die if they knew how much I got for that place. DV: How is business since you left? JG: They’re booming. They haven’t missed a beat, except those meat prices keep going up. DV: Does he still use your rubs, sauces, and sausage recipe? JG: Yep. Everything. I stayed for six weeks to show them the ropes. It wore me out. I lost seventy pounds in the ten months I worked there running ignorant. DV: Now you have more time for the competition circuit. When did you begin to take that seriously again? JG: Really, just after I sold the restaurant. I have the new motorhome. I want to do thirty cook-offs this year. I want to see how I can hold up against the big boys. In March, it’ll be every weekend. DV: How much does it cost just in ingredients to enter a barbecue competition? JG: Not counting fuel for my motorhome, you’re looking at $600 just to enter. DV: And the prize money? JG: They usually pay the top three, and third place gets about $150. The return on your money in barbecue is not good. Trying to make a living on the barbecue circuit is not going to happen unless you have big sponsors. We’re not NASCAR. DV: You’ve also been a television star on BBQ Pitmasters. JG: I was on season one where they followed us around to different competitions. That was the fun one. Then, I was on season four. DV: You also helped another competitor in the latest season. JG: Matt Pittman. He bought a pit and I showed him how to use it and how to run his fire. Then I helped him develop some rub recipes. He’s turned out to be a good cook. DV: I drove over here knowing where I was going, but I noticed there’s no sign out front for your shop. Why is that? JG: I don’t need one. DV: We’re out here in Rendon, but is this where you grew up? JG: I lived in Riverside in Fort Worth. Over where Sammie’s Bar-B-Q is over on Belknap, that’s Riverside. DV: Is that where you ate barbecue when you were growing up? JG: I would go down there and help them load turkeys when I was a kid coming in from school. We lived over in the ghetto, and I walked by there on the way home, smelling that smoke. DV: Was that your start in barbecue then? JG: My dad had a big old pit too. It was a big kettle with a big lid that swung out. DV: Do you still go visit other barbecue restaurants now? JG: I don’t hardly ever eat barbecue. After you work around it, it doesn’t even taste good. I’ll cook some salt a pepper ribs for myself here at the house. DV: What is it that sets the Jambo apart from other smokers? JG: The insulated firebox and the airflow. It flows through there at a smooth, even pace. Wood consumption is half of other stick burners, and you’re at a real good advantage when it rains because it doesn’t cool that firebox. DV: You’ve only been at this for eight years, but it’s been a good eight years. Is building pits what you were meant to do? JG: It is. This was my calling in life. I always wanted to be in business for myself, and that’s where I am now. If I want to go hop in the motorhome and drive to a cook-off, I can. I’m my own boss. Cook-offs are a way to advertise and have fun. It’s just like other hobbies. It’s about as much fun as you can have with your clothes on. Enjoyed reading this article about our good friend Jamie– we live in central Florida and have 2 of his BBQ pits. Our youngest son has just started doing some BBQ competitions locally. Jamie’s wife and daughter visited my restaurant before opening his, just to look around. Thank you Jaime for mentioning Craig’s BBQ Sauce. Many quality teams like yourself use my sauce and we certainly appreciate it! I have been using Adkins Seasoning for years myself. Pam Adkins sold the place awhile back, but I still have it shipped to my house. It is very good stuff. I judged a cookoff in Longview TX last year and Jamie cooked in this one. I don’t remember how he did and only had a chance to say hello. But I do what to say congratulations on winning the Kingsford title. I live in AUSTRALIA & I would like to get a copy of the plans to build one of your pits here in Australia. So if that is possable Please.